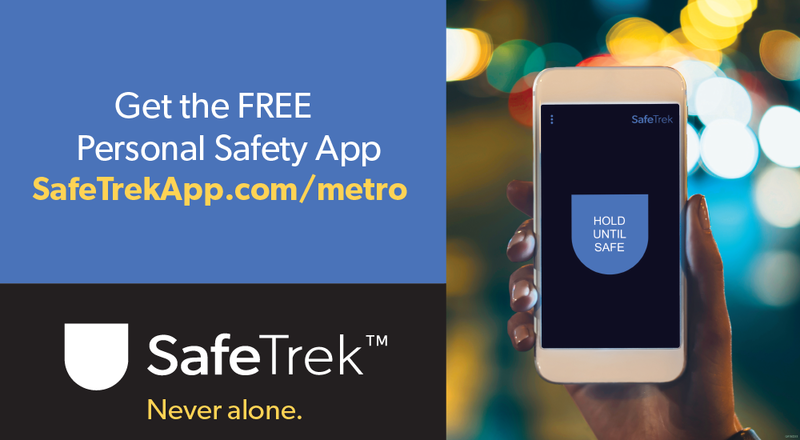 The SafeTrek app will notify law enforcement if you need emergency help when you’re on the Metro system. Metro has contracted with SafeTrek, a mobile personal safety application available on iOS and Android devices, to help transit riders feel safer when they’re on the transit system. If you feel uneasy or uncomfortable, open the SafeTrek app and hold your thumb on the safe button. Once you’re safe, release the button and enter your customized four-digit pin number. If you need help, release the button without entering your pin number, and SafeTrek will give local police your name, emergency information and location. SafeTrek dispatchers provide assistance from the moment an alert is triggered until police arrive. If you cannot or do not wish to speak with dispatchers, text or even stay silent and emergency help will be dispatched. Sign up for SafeTrek by accessing this special link: safetrekapp.com/metro. After you enter your phone number, you’ll be sent a link to download the free version of SafeTrek on your phone. The app is free for one year for riders who sign up. SafeTrek not only works on the Metro system, but also anywhere in the bi-state region as well as in other cities. Great! I wish someone would have thought of this sooner but it’s good to have it now. Thank you. I tried to use SafeTrek last night in what felt like a dangerous situation when I was alone in the train car with a raging maniac screaming & pounding on the seat in front of him (the entire ride from CWE to Emerson Park. SafeTrek was the only safety info posted in this car. So I installed it, opened it & initially saw a message that the 1st year is free & then got a series of testimonials saying how wonderful it is. Couldn’t use the damn app to contact anyone..so wouldn’t help to stop an attack. Then I searched google & found a # to text Metro. What?? And they answered…but not in time to stop an attack. Why isn’t the Metro text # plastered all over every single car? Isn’t safety a big deal? Yesterday a guy cooked bacon with a bic lighter. Lots of cig & weed smoking esp on evening trains. Where are the guards? Oh quite busy checking my WU pass 3-4 times daily. Have ridden Metro for 2 yrs. It’s bad. And won’t even discuss the filthy disgusting elevator at CWE station injured children & disabled people HAVE to ride. People need to speak up. Which is what I’m doing now. And the metro isn’t free. We are paying customers. The end. Paulette, thank you for letting us know about your experience on board MetroLink. We are in the process of promoting the new texting service across our Metro Transit fleet in order for riders like yourself to know the correct number to text. The creation of a safe and secure system is Metro’s highest priority. The critical components of transit system safety include a coordinated police and security team; communication and cooperation between each entity; and infrastructure that is designed to encourage crime prevention. The City of St. Louis, St. Louis County and St. Clair County all have police officers assigned to provide law enforcement and public safety via a MetroLink detail; Metro employs transit authority officers; and Metro employs contract security to provide front-line security and fare enforcement. This presence across the system is critical for creating a secure transit system. We strongly recommend notifying us when your transit experience is less than ideal. You may also reach out to Metro Customer Service at 314-982-1406, customerservice@metrostlouis.org, or via text at 314-207-9786 to share your experiences across the Metro system with our management team.